I’m quickly learning that it’s really hard to reproduce realistic environmental effects in scale. 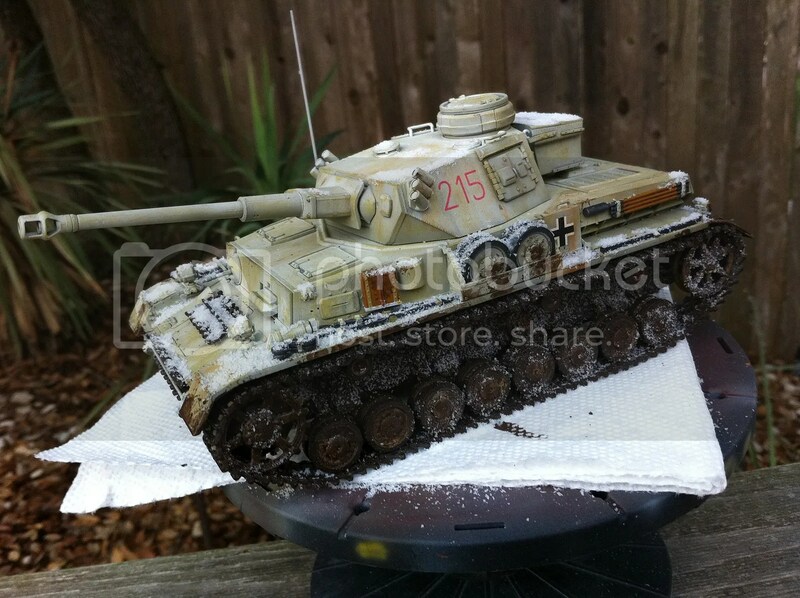 Case in point – adding snow to the Panzer IV. Adding snow makes sense. This particular Panzer was engaged on the Eastern Front in the spring of 1943 – and Russian spring is basically “OMG winter!” to the rest of the world, so yeah, snow. I originally followed Karl Logan’s process from a recent article of Fine Scale Modeler, and used Woodland Scenics snow product. Now, it’s a bit sparkly, just like snow. But past that…it’s completely out of scale. 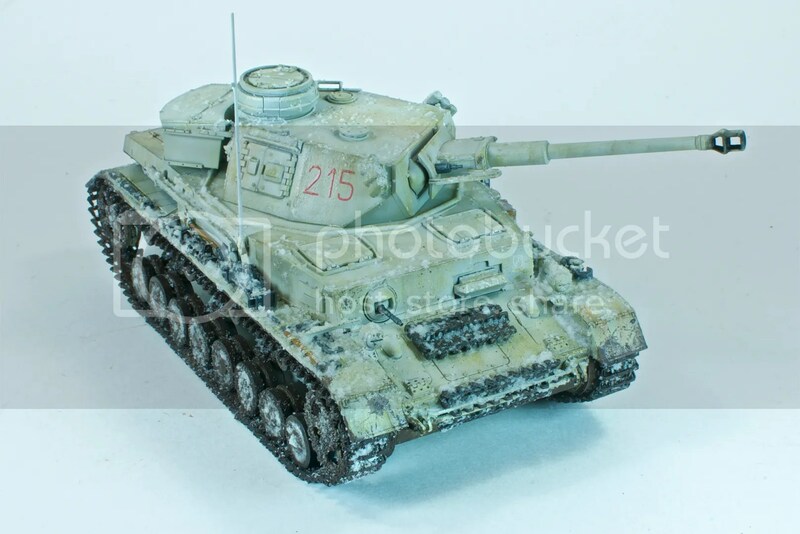 Maybe it’s less apparent if it’s being used as a snow bed for a diorama or something, but in sparing amounts, it looks like someone sprinkled pretzel salt all over the Panzer. Fortunately, I discovered that Future is great for dislodging snow attached with diluted white glue, and got most of it off. In its place, I tried a slurry of Future, talcum powder, and a bit of Woodland Scenics snow sprinkled in for sparkle. I laid this down pretty liberally, and when it started drying flat, I hit it with Future, and then came back the next night and hit it again with Alclad’s Aqua Gloss. The idea I was going for was snow melting, freezing, and remelting, as it would probably do on a fighting Panzer on the Ostfront in early 1943. After that, I painted and drybrushed the hull and turret machine guns (Model Master Gunmetal drybrushed with Model Master Magnesium Metalizer). And so the Dragon Panzer IV is done! Be sure to check out the Completed Build page, and stay tuned for my next adventure in armor! This time, I’m thinking I might try my hand at a diorama! Hi there,good job!! another economic way to reproduce snow is kitchen salt and bicarbonate,you mix them together.then mix some vinavil glue with a little amount of water,and apply on tank with brush,then you just use a sieve to apply the snow on tank.